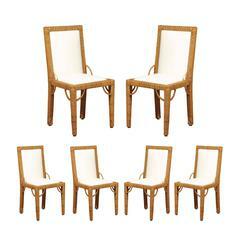 An incredible restored set of eight (8) iconic dining chairs, circa 1975. While no longer marked, the pieces are consistent with the rising sun collection produced by Gabriella Crespi during the mid-1970s. Beautifully conceived and expertly constructed rattan and hardwood frame, with seat and back inset panels veneered in bamboo. Stout and suitable for heavy regular use. The rich Tobacco finish has mellowed to perfection. The unmistakable look of old money. Fabulous jewelry! Excellent restored condition. The chairs have been professionally cleaned and re-lacquered. The semi-gloss lacquer finish demonstrates exceptional depth and sheen, the light dances off these show-stopping pieces! The rattan and bamboo exhibit a beautiful range of color. All bamboo veneer and raffia bindings are intact and complete. The price listed is for the set of eight (8). Excellent Restored Condition. Professionally cleaned and re-lacquered. The Bamboo and Rattan display a fabulous range of color. Lacquer finish with beautiful depth and sheen. All Cane accent details are intact and complete. Aged to perfection. Set of six newly upholstered, brass faux bamboo chairs. Set of six dining chairs in bronzed steel, in the manner of Mastercraft, circa 1970s. In their original red velour upholstery.